Your highest priority is to grow your business, and your customer relationship management solution should help you achieve that goal. 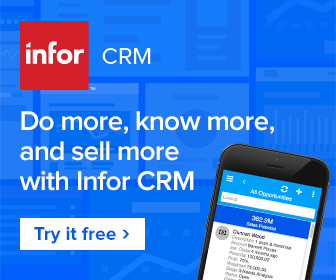 Infor CRM (formally Saleslogix) provides a complete view of customer interactions across sales, marketing, customer service and support so your teams can collaborate and respond promptly and knowledgeably to customer inquiries and opportunities. Natalie Badolato, Saleslogix Systems Analyst and Marketing Communications Specialist for Veeco (HighTech Manufacturing), shares how Veeco's sales and marketing productivity increased through automating lead generation, and Saleslogix Visual Analyzer has captured new insight into broken business processes and business trends. Dave and Thomas is a gourmet popcorn company out of Englewood, New Jersey. See how Saleslogix helps keep this company connected with real-time data, remote access, and ERP integration abilities. Sandals Resorts - Operator of all-inclusive resorts throughout the Caribbean. Headquartered in Southwest Michigan, we serve clients across the US and Canada.